A kit that includes book, clicker, and a sample of treats, to help owners get started clicker training with their dogs. The clicker is a fun way to pinpoint the the exact moment behavior your pet performs the behavior you are teaching. It communicates, “Yes, that’s what I wanted!” in a way that animals pick up quickly and truly enjoy. Melissa C. Alexander, moderator of the online discussion forum ClickerSolutions, collects clear and accurate answers to over one hundred commonly asked questions about clicker training in one essential reference. 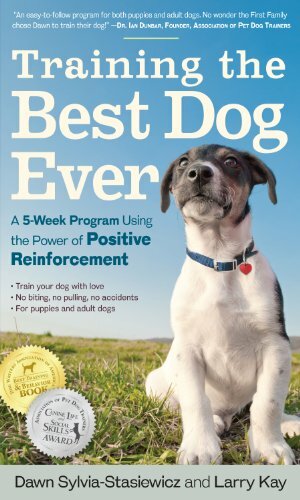 Voted the #1 BEST BOOK (1999) by the Association of Pet Dog Trainers?the largest and most influential worldwide association of professional pet dog trainers. Fun training with toys, treats, lures, and rewards. Easy, fun-loving, dog-friendly methods for teaching basic manners off-leash, and for temperament modification and behavior problem troubleshooting. It’s NOT about “dominance!” Learn how to love your dogs without spoiling them and provide boundaries without intimidation. This concise and affordable pamphlet clarifies how to be a benevolent leader and help your dog learn to be a calm and confident member of the family.Note that this book is out of print, and the Kindle version is the best purchase deal. Want to know the basics as well as advanced techniques of “clicker training.” This training manual gets you clicking quickly and easily no matter what your experience level. Works for good manners, problem-solving, sports and fun!